Originally, in the screen printing industry, there was a trade off between the levels of printability performance on the screen and the post-production quality of the finished product. However, Permaset inks have revolutionised the industry by developing water-based screen-printing and textile inks with no compromise. With most screen printing inks traditionally using plastisols for their ease and longevity, screen printing was harming the environment, and linked to a number of medical issues. Permaset inks are water-based, so contain no PVC or phthalates and don’t require solvents to clean screens after use. In fact, the Permaset Aqua textile inks can be used on swimwear, underwear and baby clothes, it’s that safe. The Permatone range of inks has been granted approval by the Soil Association, after meeting the requirements of the Global Organic Textiles Standards (GOTS). Permaset Aqua signifies a revolution in screen printing inks through using specially selected pigments and utilising the latest advances in polymer technology. Excellent durability, pure colour and an extremely soft handle are all delivered in one environmentally friendly package. In the Permaset Aqua range, there are both transparent (regular) and opaque (SuperCover) ranges, along with Process and Metallic colours, eight different ‘glow’ colours and a Print Paste. With low-odour and the ability to be easily cleaned by water, Permaset Aqua is a highly versatile textile ink. Not only does it provide a solid foundation for your creativity, it helps contribute to a safer environment. Should I use Permaprint Premium? Finding a water-based printing ink that delivers a superior performance can be difficult to find, especially one that’s good for the environment. Permaprint Premium offers unrivalled colour brightness and is safe for your printer and the environment, but eliminates solvent fumes and ensured you can easily clean your equipment with water. If you’re printing on vinyl, remember that care should be taken due to plasticiser migration potentially softening the ink over time. You may also see some cockling on uncoated papers. This means that Permaprint Premium is suitable to be used on hand-printed wallpaper, art reproduction, posters, backlit displays and even stickers. As Permaprint Premium is water-based, it has no flash point. This means it’s exempt from Flammable Liquids regulations. If you need to match colours, Permaset’s Permatone has been specifically designed to manage colour and can produce facsimiles of 950 Permaset colours. Your screen printing equipment can easily be cleaned with water, due to Permatone being water based. After heat fixing, you’ll find that Permatone prints have excellent wash, rub and dry clean resistance. The Permatone set of inks successfully meet the requirements of the Global Organic Textiles Standards (GOTS) and have been granted approval by the Soil Association for non-organic chemical inputs used in organic textile processing. Permatone inks will deliver a vibrant, pure colour, excellent levels of durability and an exceptionally soft handle whilst being 100% solvent free, making them superior textile inks for screen printing. Steve Wood Services has been supplying the litho industry and screen printers with high quality products since 1982. 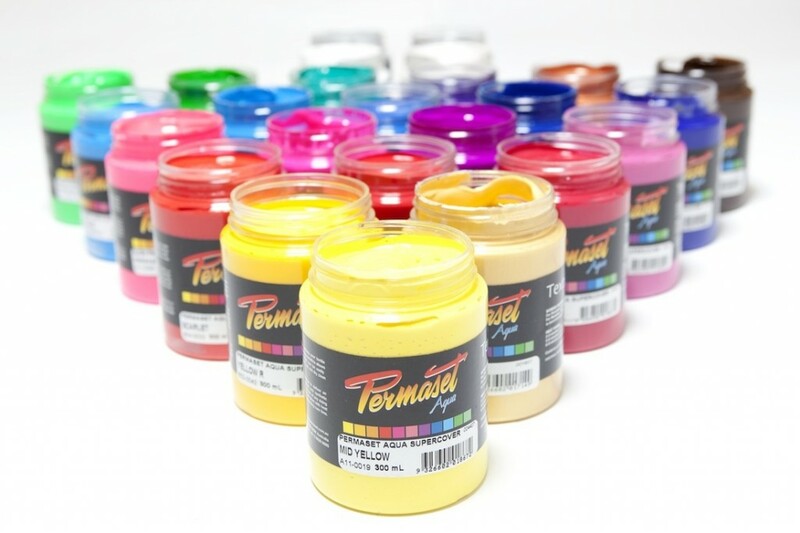 If you want more information about the Permaset range of inks, and which would work best for your screen printing, feel free to contact us or call us on 01423 358 989 today.